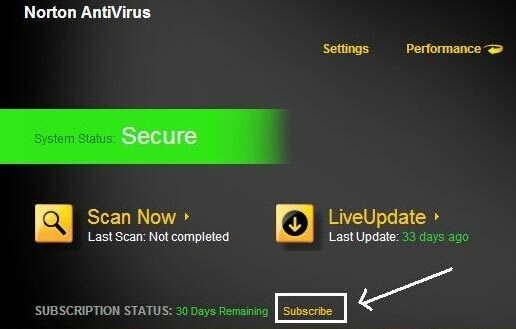 Norton Antivirus 2012 Free for 6 Months – We have already shared free antivirus promotions before in which you can get Norton Antivirus 2012 90 days trial and Norton Internet Security 2012 free for 3 months but many people say that 3 months is not enough for them and they want at-least 6 months free license keys. But the problem is that i have tried hard to find out the license keys for Norton Antivirus 2012 but haven’t succeed. So try another thing and this time i come up with a trick through which you can activate Norton Antivirus 2012 Free for 6 months. 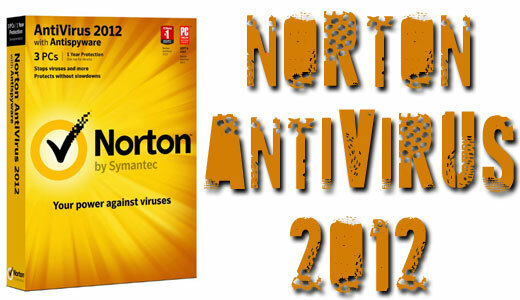 But first we look at the new features of Norton Antivirus 2012. Norton Antivirus 2012 is being rated no.1 antivirus in the world and continues its great reputation. It is so proactive that it can save your computer from viruses before even they damage your computer. You will be wondering how Norton will do this. Well Norton Antivirus 2012 has 4 layers of smart and intelligent protection which makes sure that you will never come face to face with bad stuff. I have personally use Norton Antivirus 2011 and Norton Antivirus 2012 and found an amazing scan speed difference. Norton Antivirus 2012 is lot more faster in speed and uses less resources than NA 2011. Another great feature i like about this new sensation form Norton is that it runs in background so you feel free to work, listen to your favorite music, surf internet or watch movies. Its amazingly so powerful and light that you dont feel that your system has antivirus install in it. Now you don’t need to optimize your antivirus software according to your system because it will automatically choose best settings for your computer and in just one click you will be able to run the scan. Its also very proactive in telling you about files which may slow down your computer or even crash your system. 2. Regular checkups and Download Insight 2.0 option. 3. SONAR 4 Behavioral Protection and Norton Management. 4. Browser, Vulnerability and Network threat protection. 6. Norton Boot-able Recovery Tool. 8. Smart scheduler with Power saver settings. 9. Email and instant message monitoring. How to get Norton Antivirus Free for 6 Months. 1. Back in 2009 Symantec has giveaway Norton Antivirus 2009 free for 6 months and guess what this promotion is still valid. You can’t find the promotional page as it was removed by the Symantec but you can download Norton Antivirus 2009 with free license key of 6 months from here(82MB in size). 2. After download the software install it. You will see a screen with big word ZUSTIMMEN & INSTALLIEREN on it, Just click it and continue till end. 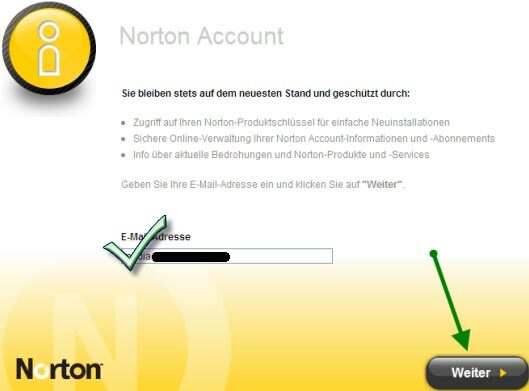 It was a German promotion so this software will be in German language but dont worry we will tell you how you can use this to activate your Norton Antivirus 2012. 3. After installation restart the computer and then you will see a screen like below. Simply enter you legit E-mail address and click Weiter button. 4. On next page fill out all your personal information because it will be used for registration at Norton Portal. Again click Weiter button. 5. Now go to this page[link] and login with your Norton username and password you have just registered. Click the product name and copy the activation code to the safe place like Notepad and save the life. 6. Uninstall Norton Antivirus 2009, yes you read it right just uninstall. 8. Install the software but used another E-mail to activate it for 30 days trial. 9. Now run the software and on main screen you will see the Subscribe link. Just click on it. 10. On next screen you will definitely see a link I have a code or key to enter, just click the link and enter the activation code you saved in Notepad file earlier. Note: If you don’t want to do all above steps than we can E-mail you activation key. For this you have to like and share our Facebook fan page, Twitter page or Google Plus Page with your friends and also leave a comment below with your details and E-Mail address.